GREENBUSH, MN (July 5) - The Northern Outlaw Sprint Association roared back to Greenbush Race Park Saturday night with 19 410 cubic inch Sprint Cars. 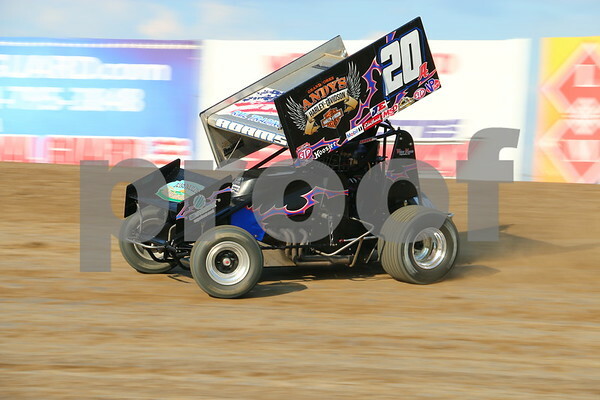 It was a late night of racing as the area had 2” of rain on Friday. The staff prepared the track all night to get the facility ready only to have it rain .75” of rain 45 minutes before race time. The track crew worked hard and fast to get things race ready with only a 90 minute delay before a full house crowd. When the racing got underway, pole sitter, Jordan Adams held off Jade Hastings, Austin Pierce, Chris Shirek, and Tom Egeland to pick up his first-ever NOSA A-main victory. Adams credits the fact that he and his crew have got his new chassis dialed in and working perfectly. Jade Hastings also scored a career best finish as he brought is A City Transmission #8H across the line in The runner up spot. Heading into the night, Lou Kennedy Jr. led the point standings by a mere one point over Austin Pierce, but Kennedy Jr. ended up sitting the night out due to a nagging knee injury. Pierce's third place effort in the feature has now catapulted him into the points lead.